For the duration of the financial crisis a battle of economic ideas has been waged between governments implementing economic austerity in an attempt to shrink budget deficits as experienced by much of the Euro-zone and that of money printing inflation as experienced by the U.S. and UK. That battle is now coming to an end as the voters of first France and then Greece have rejected severe economic austerity that has seen economic depression in Greece and at best stagnation in France for the alternative solution of money printing inflation. 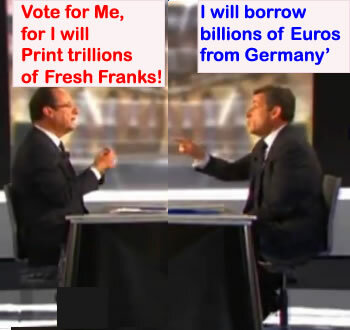 The weekend saw François Hollande win the French Election with a 51.9% share of the vote on promises to end economic austerity, which can only be achieved by printing money (debt) which will put him at war with the Bond markets, unless he can convince Angela Merkel to monetize French debt. Meanwhile in Greece the mainstream parties were punished as many voters opted to blame immigrants for their own problems by electing far right extremists leaving no party or existing coalition in overall control. The crisis being that parties in favour of the bailout and accompanying austerity are now in a minority which threatens to delay the release of further scheduled bailout funds as Greece drifts towards another election in mid June. Whilst the mainstream press in the US and UK have written much about economic austerity in these countries, the actual facts tell a completely different story. The facts show that there has been NO net economic austerity in these countries. For instance the annual budget deficits remain little change to that of several years ago with the result that the debt mountains have continued to balloon ever higher and to finance these deficits countries such as the UK have been printing money on an unprecedented scale that will feed the Inflation Mega-trend for the whole of this decade, never mind that far more money printing is yet to come as I warned of over 2 years ago in the Inflation Mega-trend Ebook (FREE DOWNLOAD), that the only solution, THE ONLY SOLUTION the governments have is to PRINT MONEY in an attempt at inflating the debt away. This has created huge opportunities for those that have leveraged themselves to the Inflation Mega-trend as illustrated most aptly by the Stocks stealth bull market that began in March 2009 at Dow 6470. With far more opportunities that lie ahead as the flood of leveraged money cycles through markets such as the depressed housing markets. Off course there is a price to pay for money printing inflation, and that price is being paid by everyone who is not leveraged the Inflation mega-trend which means those on fixed wages, who I forecast could experience a real terms loss of disposable incomes of as much as 25% by April 2013, and savers with money deposited in risky banks that could literally implode overnight as a consequence of the risk of Euro-zone collapse which this months elections increase the risks of. In such an event it would not matter that the depositors would probably get all of their money back because the price of rescuing the banking system from financial Armageddon would be such that those funds on deposits would have lost most of their value by the time they gained access to their funds. Meanwhile, All UK politicians are continuing to play the bogus economic austerity card, with Labour beating the Conservatives with the Austerity hammer and the Conservatives using it as a banner in their defense that the UK would be where Greece and France are without austerity, when the reality is that there has been NO real economic austerity in the UK because government spending continues to INCREASE every year ! The UK government will spend £731 billion this financial year, which is set against last years £713 billion, £691 billion in 2011 and £669 billion in 2010. Every year has seen an INCREASE IN GOVERNMENT SPENDING ! That is a fact. The Bank of England is monetizing UK government debt, to achieve this it has so far conjured £325 billion out of thin air. The effect of this is two fold, it floods the market with sterling bonds so makes the currency weaker whilst at the same time driving interest rates for government bonds lower hence lower financing costs. Many readers may ask, if there is no economic austerity then why are we suffering? As explained earlier, most people in Britain are suffering as a consequence of RAMPANT MONEY PRINTING INFLATION that is resulting in the loss of purchasing power of your earnings. Whilst economic reality in the UK will be difficult for most today, however interest rate hikes are just around the corner as consequence of money printing Inflation that are likely to add to personal budgetary woes. Yes, I am surprised that the Bank of England has managed to resist raising the base rate for thus long, but they have not prevented retail market interest rates from steadily rising for the past 12 months as illustrated by Mortgage rates typically now at 4% and above. At some point it will dawn on the academics at the Bank of England that UK economy is not responding to near zero interest rates because it promotes an artificial anti-competitive market that is deterring investment and economic growth as a consequence of NEGATIVE REAL INTEREST RATE (base rate below the rate of inflation). When they realise this reality, they WILL raise interest rates. My long standing forecast for which remains for UK base interest rates to rise from 0.5% today to 4% by the end of 2014 (Interest Rate Mega-trend Ebook - March 2011). 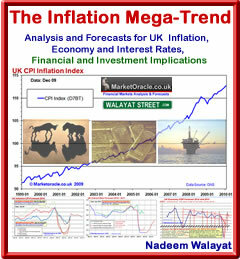 The UK immersed in an long Inflationary depression as illustrated by the below graph which shows that despite the wide spread mantra of Deflation as regurgitated at length in the mainstream press for the past 4 years, the UK on the governments preferred CPI measure has experienced inflation of 15% over the past 4 years, (real inflation tends to be 1-2% per annum higher i.e. 25%), whilst the UK economy in terms of GDP remains 4% below its 2008 peak. That net economic pain of at least 20% is not being picked up by the bailed out bankster's, but being paid by ordinary workers and savers. So when the coalition government politicians promote the crisis in France, Spain and even Greece as examples of where the UK could be, know this that we are already there and don't even know it as a consequence of the money printing smoke and mirrors inflation! In fact the truth is that the UK in terms of Debt to GDP (500%) is more indebted than either Spain (390%), Italy (320%) or France (360%) as a consequence of the bailout of the UK's bankrupt giant banking sector that remains an ever present ready to explode weapon of mass financial destruction. It is clearly not sustainable to continue SPENDING money the country does not have, that inflates the debt mountain ever higher that pushes inflation ever higher because there is more money in circulation chasing the same goods and services. This IS how countries go bankrupt stealthily, well until the hyperinflation panic event. However, until that point in time all that the UK government is doing is to buy time. For what ? To get through to and win the next general election which is usually the primary objective of all governments. And, It is this which euro-zone politicians are seeking to replicate - the economic illusion that an Inflationary Depression brings along with it, for it allows politicians to point to countless statistics that give the illusion of economic stability that the general population tends to swallow despite the fact that their own personal experience suggests otherwise. Euro-zone States Great Escape from Germany? Which means that countries such as Greece, Italy, Spain and even France will at some point decide to cut the noose that Germany has around their necks, where they have to beg, borrow and steal euros from Germany, and instead choose to engage in rampant money printing inflation that their electorates demand of them to play catch up to the UK and US which means that the Euro-zone as we know it today will cease to exist, even if somehow it still goes by the name of the Euro-zone. We can all speculate on what will replace the current single currency Euro-zone system, but at its core will be the ability for each country to PRINT MONEY. This means that countries such as Greece will return to the pre-euro levels of high inflation rates, possibly as high as 30% per annum. And countries such as France which in many aspects resemble the UK economy, will follow a similar inflationary path to the UK after an initial surge in inflation following the initial money printing run as Francoi Hollande dusts down and restarts the French money printing presses. Contrary to what you hear in the mainstream press of German exasperation at countries such as Greece and Spain, the truth is they will fight tooth and nail to prevent these countries from escaping from the German stranglehold. For Germany the euro-zone has remained hugely beneficial as a consequence of a captured market that has German manufactured goods stuffed down their throats against which no other Euro-zone country can compete, as well as a weak Euro held in perpetual crisis by bankrupting states allowing Germany export to the world without suffering the consequences in terms of loss of exchange rate competitiveness that it would experience were it trading with the Deutschmark. So contrary to the politics, it is Germany that wants the Euro to continue in its present form more than any other Eurozone member. However on the flip side Germany will never agree to the level of rampant money printing of Euro's that countries such as Greece and France are voting for, because of the Inflation consequences that Germans tend to fear more than economic stagnation, hence why I just cannot see how the Euro will survive. The Euro-zone is literally tearing itself apart which this months elections are just the latest milestone of. When Will the Euro-zone Blow up? I could speculate on when the Euro-zone will eventually blow up, but the truth is that there are now so many potential triggers that it could come at any time. We have the crisis in Greece, we have the Spanish Banks going bankrupt, we have socialist money printing France, and then we have Italy, Portugal and Belgium also at crisis point. My best guesstimate is that the trigger for Euro-collapse will come from Spain because it is too big to bail and is tottering right on the very edge as illustrated by a 24% unemployment rate that is higher than that of Greece's 22%! Spain IS the big story that is being drowned out by too much competing media Euro-zone noise. My next series of article will look at the specifics of how the Inflation mega-trend will continue to play out, ensure you are subscribed to my always free analysis to get this analysis in your email in box.